Posted in: A Walking Tour of Old Ravenswood. Tagged: 4307 N Hermitage, Arthur Cole, Inland Architect, John Cole, Lake View Pumping Station, Lake View Township, Martin Cole, Ravenswood Land Co., Robert McLean, water works. Look at the intact wooden ornament, including eccentric mixture of Italianate brackets and fleur-de-lis cutouts under the gable’s cornice. The bay on west facade, window surrounds, recessed double front doors with coffered jamb and window transom, and possibly original porch. Note the elongated windows. Possible addition adjacent to front porch, as well as rear porch addition. 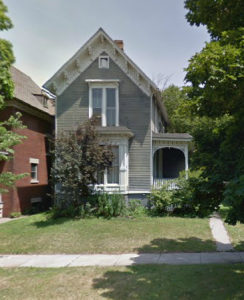 The main entrance to the house was off Cullom, because this house apparently predated the one immediately to its south, which is said to have been built on this house’s front lawn. The small house just east of the corner lot was the carriage house for 4307.
this house. While in Ravenswood John Cole worked on the sewer system mentioned earlier. Also, in 1884 he helped redesign the Lake View Pumping Station at Montrose and Halsted, which first brought lake water to the Township in 1875. Prior to this time, and even after, shallow wells were the main source of water. Most house also had cisterns. In later years John and Arthur Cole lived in Hyde Park, while Martin lived on the west Side. Presumably the houses were rented; for example, Robert McLean, the editor of the Inland Architect, lived in one of the houses from 1887 until 1890. No Permit. Recorder of Deeds Office; 1880 Census. Historical records. Continue the tour to 4600 North Hermitage Avenue, the Ravenswood Presbyterian Church. The next building is across the street, about 72′ from you.